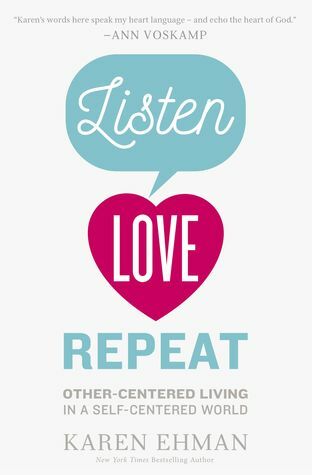 Not to take anything away from this book, but Listen Love Repeat isn't rocket science. It's core message is about taking the focus off of your own issues and loving God by loving His people. It's really a simple three-step approach: 1. Love God. 2. Love People. 3. Then, do it again and again. But what seems so simple is principle is often difficult to put into practice. In this book, Ehman makes the theory practical, tangible, and attainable. She shows us how easy it can be to care for the hurting, care for our families, and even care for people who at first glance don't seem very lovable. The author's practical approach, based in God's Word (aka The Holy Bible) is thought-provoking. For me, it convicted me in many areas of my life stretching me to grow, go, and give more of myself. I truly believe Ehman is a strong woman of God who has a passion for not only caring for people but helping women grow into more developed, mature Christians. Recommendation: If you're feeling like your life doesn't have as much purpose as it should, I think this book will help show you how the little things you are doing (or can do) help you help others. And in today's cantankerous climate, I think we can agree that we can all use a little more love.